Lifelong volunteers and philanthropists, Cynthia “Cindy” ’83 and H. Martin “Marty” Chomiak ’81/’84 know the tremendous impact one small contribution can make. 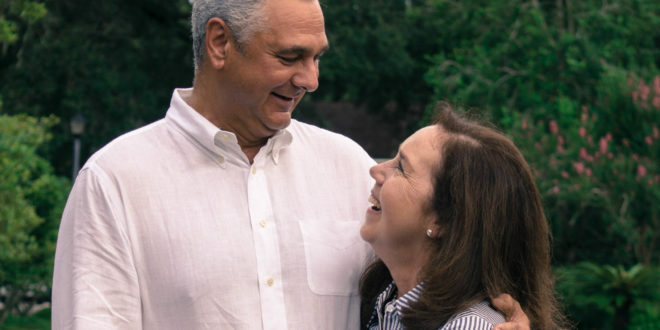 Having spent their lives living around the country and the world, the Chomiaks have remained steadfast to the philanthropic spirit given to them by their mothers—a commitment they have now passed along to their children, Catherine and Christopher. In addition to their generous contributions to Jacksonville University, the Chomiaks have worked with organizations including March of Dimes, Girl Scouts of America, Southern Ocean County Hospital Association and many more. At JU, the Chomiaks have made annual contributions to the University for an incredible 38 consecutive years and are members of the new Shircliff Circle, a giving society that honors individuals who give for three or more consecutive years. They have been participants and advocates for the ASPIRE campaign from the beginning, making their first priority the ASPIRE scholarship program, through which they have now given life-changing financial support and mentorship to some of the University’s best international students. Cindy, a Jacksonville University Board of Trustee member since 2015, founded Educated Decisions, LLC in 2007, a college admissions consultancy that helps navigate high school students through the admissions process. Marty, a member of the Davis College of Business (DCOB) Advisory Board, recently retired after 34 years with Johnson & Johnson, working for the healthcare company around the globe in positions of increasing responsibility. 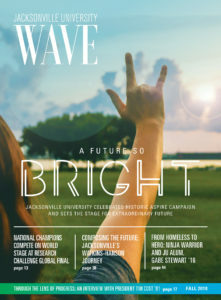 The couple sat down with WAVE Magazine to discuss their influential and amusing experiences together as students and what it means to be a part of the University’s growth today. JU: How did the two of you meet? Marty Chomiak (MC): We met at the Rathskeller over the foosball table. We spent the evening talking until the Rat closed and I went back to my dorm and she went to her’s with some of her sorority sisters. We ended up right back to talking on the phone on one of those permanent landlines that don’t exist today. Cynthia Chomiak (CC): A rotary dial. MC: No, mine was touch-tone. CC: Mine was a rotary dial. I remember pulling the phone out into the hallway where Marty and I talked until two or three in the morning. MC: It was 4 in the morning. We sat there just talking and we hit it off. JU: Looking back, were there any specific experiences you had as students that have impacted your life today? MC: There was one toga party … just kidding. In retrospect, it was the opportunity to chart my own course. I got involved with student government, Greek life, and intramural sports, and it allowed me to do things I hadn’t done before while, at the same time, making changes. JU: What would you say has changed the most about JU? MC: For me, the caliber of the education has become stronger and more dynamic. I have seen this growth over the years, and it keeps getting better and better. I see how powerful and impactful that education is to the students. CC: I think it was very fortuitous when we were enrolled, JU started the nursing school, and I remember thinking ‘why are they doing that? This is a liberal arts school.’ But it was just great foresight. JU has continued to add agile and dynamic majors over the years like Nursing, Aviation and the Marine Science Research Institute now partnering with OCEARCH. It’s not only the education. I haven’t met a student on the campus these days that hasn’t impressed me. It just gives me hope that our country and our world are in good hands, because they are all are rock stars. JU: With the ending of the ASPIRE Campaign raising an unprecedented $121.4 million, how does that make you feel about your alma mater knowing that you were a part of that achievement? CC: Proud. Super proud that the community, the JU family, faculty, staff, corporations, came together to reach this goal that has already impacted not only the beauty of the campus but also new programs, an increased endowment, and scholarships. It’s amazing, and there’s so much more to be done. It makes me feel proud that I’m a JU alum. MC: What impresses me is that so many other people outside of JU now look at the University and see what JU can deliver. They see what it does for the students, what it does for the community. And they believe in all the good things JU is doing. JU: Tell us about your experience with ASPIRE scholarships. CC: We loved the idea of ASPIRE scholars. Having lived internationally, we realized how blessed we are in America, and that’s not always the case for people who live overseas. The stipulation for our first scholarship was that they had to be an undocumented student or a student on a refugee visa. We were purposefully trying to help someone who we knew would have additional challenges. These kids come over and take every opportunity presented to them and really make a difference on campus. They make JU a more empathic and caring place. Marty’s grandparents came over from the Ukraine through Ellis Island, and my great grandparents came over from Norway, so I think of the ASPIRE scholarships as our little way of helping this next generation of immigrants coming to America. JU: How has your involvement with JU over the past few years impacted your life? CC: When we leave campus, we don’t get in the car, put on the radio, and drive home. We talk about what more we can do. We leave so energized. Whether it is a play, musical performance, public policy event, or watching Jacksonville Who?, the film by Frank Pace. It’s the same when Marty comes home from a DCOB meeting. He comes back so energized that we spend a whole dinner conversation talking about it. JU: What advice would you give to alumni or future alumni about why they should get involved? How do we inspire the next generation of volunteer leaders? CC: I hope that young alums, or even alums our age, will see the value in not only giving of their time and talents but also their resources. No matter how large or small. It could be half a day, once a year, or it could be a $25 check. Everybody pitching in gives you that sense of pride in your community and your campus. It makes you feel like you belong, and that’s a good thing. It’s not about what someone can give. It’s about having that pride in giving.